Speech-language therapy is a term commonly employed to describe courses of therapy that address both verbal speech concerns as well as difficulties with verbal and/or written language. Often this type of therapy is simply referred to as speech therapy though there is a language dimension included as well. Below are some answers to frequently asked questions about speech-language therapy in the United Kingdom. Speech-language therapy is the therapeutic treatment of speech and language difficulties and disorders. This therapy that helps to prevent, diagnose and/or rehabilitate an individual’s speech and language difficulties. A variety of individuals with different speech and language difficulties attend speech-language therapy sessions. Individuals who have difficulty speaking, listening, reading and/or writing may all benefit from such therapy. Very often the individuals attending speech-language therapy are children, as this is when delays or difficulties in language skills first become apparent. In particular, those who have trouble learning the alphabet and/or the sounds of particular letters, syllables or words, those who have difficulty learning or using new vocabulary, and/or those who are unable to comprehend written or spoken language may all attend speech-language therapy sessions. Where Does Speech-Language Therapy Take Place? Speech-language therapy may take place in a wide variety of locations including in a private therapist’s office, at hospital, at school, at an individual’s home or even in a public hall or community centre for group sessions. 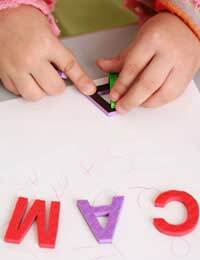 A variety of activities may be employed, including sound or word repetitions, rhymes, conversational activities, reading and comprehension activities, puzzles, word or sentence scrambles, and reading aloud. Depending on the age of the client, play time activities and school work may also be the basis of a session. If a child is being treated, parents may be asked to attend sessions as well to familiarise themselves with the activities so that they may be engaged in consistently at home. Trained, qualified speech and language therapists (or pathologists) lead speech-language therapy sessions. In the UK, all speech and language therapists complete a degree course and must register with the Health Professions Council. Most speech and language therapists will also be a part of the Royal College of Speech and Language Therapists, the representative body for the profession. How Can I Learn More About Speech-Language Therapy? A number of organisations exist to support individuals with speech and language difficulties and disorders in the United Kingdom and these organisations may be able to provide further information on speech-language therapy. Christopher Place, The Speech, Language and Hearing Centre (www.speech-lang.org.uk) and Talking Point (www.talkingpoint.org.uk) are just a two of these organisations.